We train people for and place them into occupation and training programs in the commercial and industrial-technical departments. Cooperations with vocational institutions and employers enable us to design the preparatory courses and training programs to the job profile of the respective companies and institutions and thus to help fashion the transition of our participants into the training program and occupation. Our regular offers comprise vocational and training preparation, mentored internships in cooperating partner companies, placements into training programs and jobs as well as special tuitions. 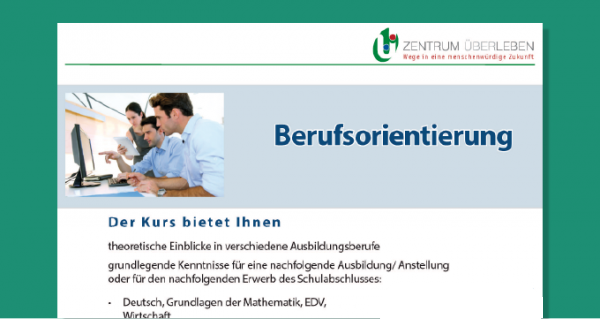 The Zentrum ÜBERLEBEN offers participants who are interested in a training program or occupation in the commercial or industrial-technical department a vocational and training preparatory course free of charge. 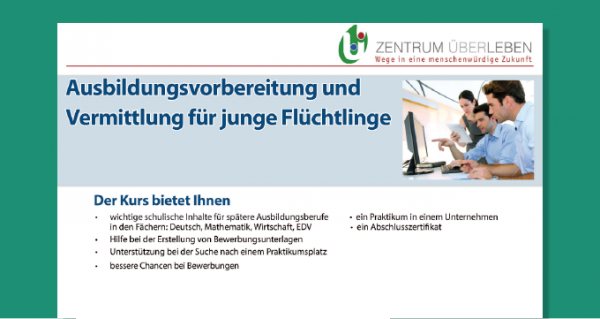 During the training program, the entry level vocational qualification or the preparation for a highschool diploma we offer supervisory support through special tuitions in German and maths, preparation for the final exam and social educational care. More information regarding each course can be obtained from our multlingual flyers.